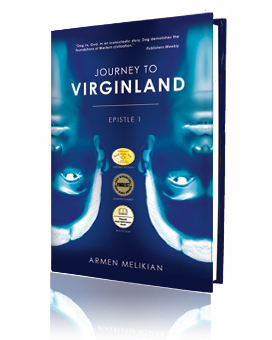 With the publication in 2012 of his first work, Journey to Virginland, Armen Melikian dealt a crushing blow to critics of contemporary literature who maintain the death of the novel. Melikian brought a fresh, prodigiously layered voice to contemporary literature, not only expanding the boundaries of the novelistic enterprise as an artistic medium per se, but infusing it with extraordinary urgency and relevance in terms of sociopolitical, cultural, religious, and philosophical thought. With its dazzling thematic scope and sheer storytelling prowess, this novel, (the first Epistle of a trilogy) is in a league with the landmark kaleidoscopic works of contemporary literature, including those of James Joyce, Thomas Pynchon, and Umberto Eco. Given its prescient vision of the shape of things to come, this novel has also been compared to the politically explosive works of George Orwell. Today literature is awash with formulaic works in which originality is registered as but vogue, unable to deliver the truly transformative power which is at the heart of all great art. Melikian’s work is a breathtaking exception to the trend, claiming its rightful place in the pantheon of contemporary literature. Interested in reading new contemporary literature? Get your copy of Journey to Virginland today!